“Cyborgs.” Do we deserve our defenders? Defense of the Donetsk Airport (DAP) lasted 242 days, from May 26, 2014 until January 20, 2015. The final fierce fighting erupted on January 16, 2015 and involved continuous shelling as well as gas attack on the airport’s defenders which employed an unknown poisonous substance. Part of the new terminal was demolished by explosives on January 19, and over 50 soldiers died in the last days of the defense. People would say that “our boys endured it all, it was concrete walls that yielded.” Ukrainian forces gradually left their positions in the DAP. A year ago, Ukrainians admired defenders of the airport and anxiously watched the news: “Are our boys still there? Are they holding?” These soldiers, nicknamed “cyborgs,” embodied heroism, daring, and courage. What has happened to this image after a year? What has happened to the memory of the defenders of the country? We are not speaking just about celebrations. After all, the “cyborgs” defended the new country: independent, successful, living honestly. How are we using this opportunity to build such a state, the opportunity obtained by fighting off the enemy? Is our society worthy of its defenders? We discussed these issues with “cyborgs” and their loved ones. “We all should remember the days of the DAP defense. I served with the 9th Company, 3rd Battalion, 80th Brigade, which held the terminal in the last days of its defense. I was in the airport until January 15, then was wounded and evacuated; an armored truck pulled up, comrades loaded me up and took out of there. I spent three months in the airport zone, and a few days in the terminal itself. I do not know what helped me to endure and survive it. Most probably, it was people’s prayers. “Following the injury, my heart stopped beating for eight minutes, I had amnesia. Thus, I remember clearly only the moment of injury, all the rest is covered in a kind of fog. The army then determined me unfit for military service, and head of the Rivne Oblast State Administration offered me the position of head of the administration’s infrastructure and industry department. I have headed it ever since. I sometimes feel like armed response would be appropriate in my new position as well (laughs). “My stepfather Anatolii Chupylko volunteered for the war in eastern Ukraine directly from the Euromaidan, then he was mobilized and fought with the 90th Separate Airborne Battalion. It seems he died on January 20. It took us a whole month to recover the body. A separatist militant called us from his phone and told us to come and take his body, for he had been killed. We just failed to grasp it at once, kept hoping for a month. We had conflicting information, saying that my stepfather was captured or wounded. The body was finally recovered by people from the Black Tulip [the mission looking for the bodies of the soldiers killed in the anti-terrorist operation area. – Ed.] or people associated with this organization. 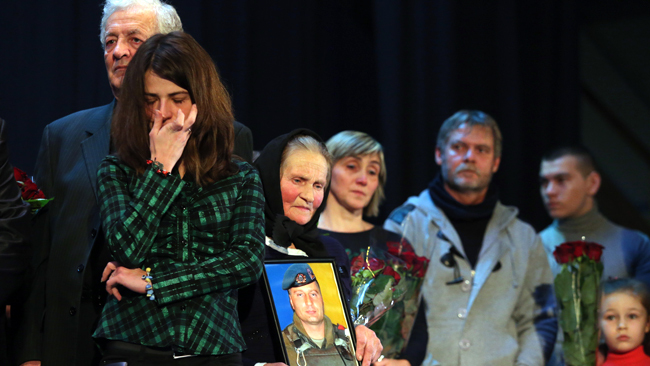 “My son Andrii entered the airport with his 9th Company on the night of January 13 past year. They went to the aid of the 7th Company. My son’s comrades did not want to take him into the battle, since he was skinny and frail. Still, he jumped on the vehicle, the 19th soldier to ride it on that night. My son was 23 years old. He had no family of his own, telling me that he would marry on coming home from the war.